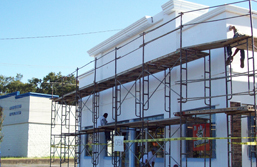 Whether it is a renovation, expansion, or a complete restoration, Ingram Plastering & Co. is ready to for any job. Our versatility and large work staff eliminates the hassle of dealing with multiple contractors, making 'restoration experience' a smooth construction process for clients. We believe the reason for our continued success is the partnership we develop with our customers. Read what our satisfied residential and commercial clientele have to say about our services. "Ingram Plastering & Company were very friendly and professional. Their work was done in a timely matter and excellent." "Ingram Plastering & Company has completed several projects for me over the years. They do quality work and always in budget." "Ingram Plastering & Company work was very impressive and with in budget." "Ingram Plastering & Company quality of work was excellent. The construction site was cleaned daily. They always returned my calls. I recommend their services to anyone." "Ingram Plastering & Company has done business with us for over 15yrs. If you want the work done right. I would highly recommend this company." Contact Ingram Plastering & Company at: 601-366-5045 to discuss your next remodeling project.